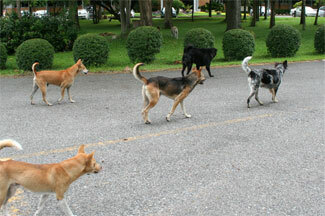 There is quite the feral dog population here in Chiang Mai and they do their best to make their presence known. The first night here a couple of the vols were forced to retreat back to UNISERV after a minor run in. You see them lounging singly or in small groups during the day - they ignore just about everything including you having to step over them on the sidewalk - but at night and early morning the pack mentality engages. Fortunatly I’ve only had 2 encounters, once on a early AM run and once at night. Both times the pack steered us clear of their stomping grounds - a single dog would usually approach fast, snarling and the group would be close behind. A few mock charges from us seem to result in detante. Maybe I’ll have feral yak packs in Ningxia.